To the newcomer the evidence of soil dissipation is frequently more apparent than to the New Zealander…[overseas experts] rarely fail to comment pointedly on the seriousness and extent of New Zealand’s soil problems. By the 1930s, there was a growing awareness of the alarming extent of soil erosion in New Zealand, including in government quarters. However, the prevailing belief among many was that it was caused by underlying environmental factors, such as soil morphology, rather than the way we were farming the land. It took the dogged efforts of soil conservation proponents such as Lance McCaskill, and Cumberland himself, to persuade politicians and officials that it was – if not caused entirely by humans – certainly exacerbated by human actions. Their efforts led eventually to the enactment of the Soil Conservation and Rivers Control Act in 1941. I noted with bitter irony that when Cumberland wrote this book, he lived in Clifton, Christchurch. 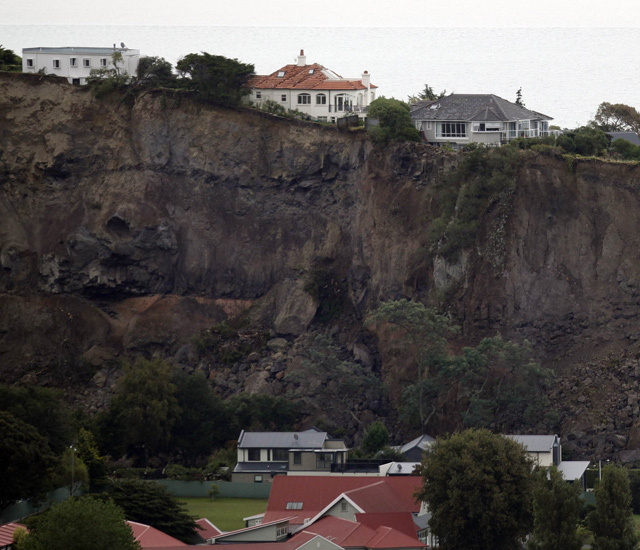 I can’t help wondering what he made of post-quake images of houses teetering on the edge of crumbling clifftops in the very place he once lived. In the first episode of Landmarks he made, he speaks of the human folly of siting the capital of the nation on top of a well-known fault line, but like most of us probably never considered the decisions being made in his first home in New Zealand (including building homes along cliffs). Sadly, this was quite literally a case of “Down to the sea in slips“, if ever there was one.